Let’s face it. Money isn’t a bad thing! It allows you to do whatever it is that you desire and of course, deserve, in your business! But, it can also help you reach and touch more people and can be a tool for you! And if you’re in the wellness business, you clearly got into this in the first place because of your deep passion to end the struggle for other people. You also want to create more accessibility to show them how they have the ability to heal themselves, as well. 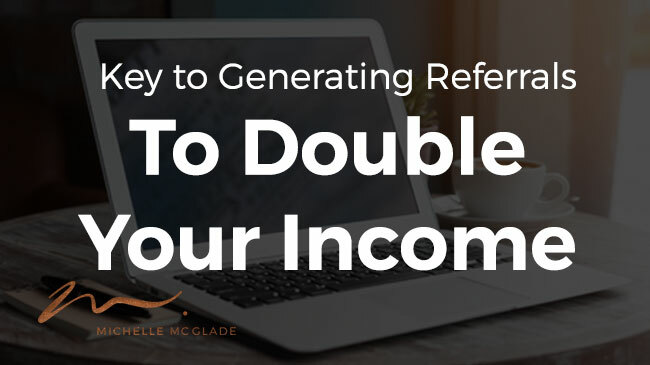 So what is The Key to Generating Referrals to Double Your Income? So, your inability to make money can prevent you from doing all of these things. I want to talk to you about the one thing you can do to generate referrals, which will lead you to double your revenue. Just one thing! I had a client at my community acupuncture clinic. She was that one perfect, ideal client! You know the one. You see their name in your appointment book and you just smile, looking forward to seeing them. Well, she ultimately taught me how to teach my clients to bring me referrals and better yet? To bring better referrals in a really powerful way. She would always ask for my business cards. Every time she came in. She continued to exhibit this behavior consistently and it stuck with me. It made me see some key elements that would really make a powerful referral relationship with clients work! But here is the thing. Referrals always start with ‘the ask’. Not all clients will ask about your business and want to pass out your cards, so it takes you asking to get the ball rolling. Obviously, without a really positive client experience, it will be hard to move forward with this. So, make sure you are thinking about and facilitating an awesome client experience! Work on providing those amazing outcomes for them! I know you’re afraid. I know you may struggle with what to say and how to say it. So we’re going to work on making ‘the ask’ a skillset, which you can learn! So my ideal client from above would always ask me, “How’s business Michelle? How are things going?” When I tuned into this, I started using it as my opener. I also noticed it with other clients. When they would ask about my business or how things were going, I would use it to make ‘the ask’. What better time?! In the beginning I would say, “we’re growing, I’m still looking to grow my business and would really appreciate your referral!” The door opened right up for me to ask and I started taking advantage of that! Boom. It’s that easy to ask. Reinforce that initial ask by making sure that before they left, they have a took in their hands! Don’t just leave it at that initial ask. Reinforce your initial conversation by offering to give them a few business cards to take with them. Now you’re talked with them twice! Once when they came in and again, on their way out. People may not know what acupuncture is or don’t know who to send to you. They’re not sure if you could help someone they may refer and they don’t want to look stupid. So, empower them and help them understand who would be a great referral to you! Let them know that a great referral to you would be someone who is experiencing the same exact thing that you are treating them for. They know the people in their circle who suffer from similar things, and you’ll be empowering them by just letting them know what a great referral would be. Your clients are a walking testimonial! Don’t leave it up to them to have to explain acupuncture or whatever it is that you may do to people they encounter. And don’t forget to thank them! One question I get asked a lot is if you should have a referral program. Ultimately, this is what I think about referral programs. For me, I want to deliver and awesome experience for my clients. I want to give them amazing outcomes and would love for them to spread the word about me and my business. But I don’t want to have to incentivize them to do that. It just doesn’t feel good to me. Ultimately, think about what feels best to you, what matches your integrity and what you value for you and your business! Making the Maven Episode 109: Your audience actually likes to see how you handle things when they go wrong. It makes you seem more human! 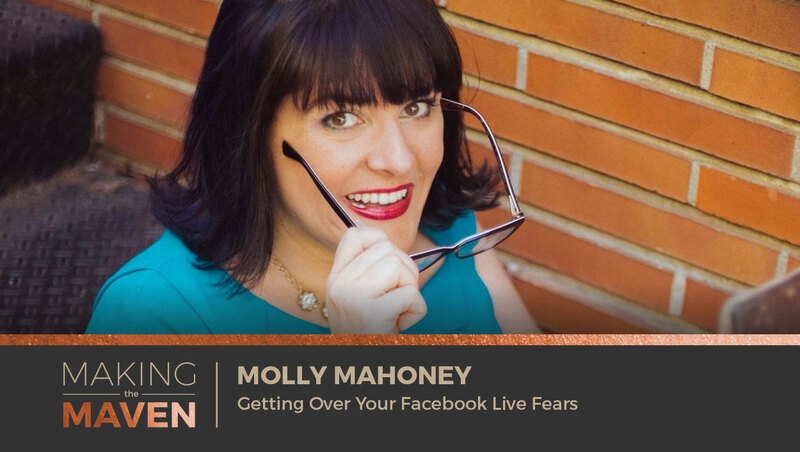 Molly Mahoney is a Camera Confidence Coach, Author, and FbLive Ninja. After graduating from Chapman University with a BFA in Theater and Dance, she toured the world working professionally as a performer for more than 10 years. Molly now leverages her performance skills and helps business owners find their confidence on camera. On this week’s show, Molly discusses why Facebook Live video is so, so important for your business, how you can become more confident in front of the camera, and she also shares some of her Facebook ad tips! *Do you suffer from underpricing your services? Then you don’t want to miss out on my workshop! *Molly is working with Les Brown … as his mentor! How did this happen? *How did Molly get started in all of this? *Shoutout to Pat Flynn’s podcast for helping both myself and Molly see what was possible! *Molly launched a course to help cure the ‘starving artist’ syndrome; it did well for a little while, and then it fell flat on its face! *Molly has been working with Facebook Live only since June of last year! *Molly recalls how heart-wrenching it was to have her course fall flat on its face. *Molly made a step-by-step list consisting of 30 steps on what you need to do to host a successful Facebook Live and switched her target audience around. *Sell the course first before you create and prepare for the course! *By doing it this way, Molly was able to bring in $55,000 in sales within 3 months! Crazy! *Are you afraid to go on Facebook Live? Molly has some truth bombs for you. *So, why are video and Facebook Live so darn important? *Molly shares a couple of Facebook Live tips so that you can engage more deeply with your audience! *How can you build confidence on Facebook Live? *Make a list of ALL the problems our ideal person, avatar, is experiencing, even if it’s not related to your business. *Do you feel like you have ‘nothing to talk about’? Molly also addresses this on the show! *Molly discusses how she uses Facebook bots the smart way, not the spammy way. Making Money. This isn’t a dirty word, it’s what you need! It’s what you want in your business to reach the level of success you’re looking for, desire and deserve! 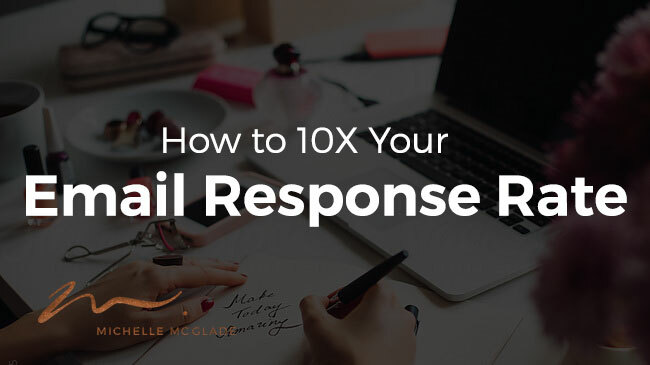 When you learn How to Increase Your Email Response Rate, you’ll be taking action to make that money! Today I want to talk to you about how you can grow your email response rates by 10 times, simply by nurturing your leads. There are statistics out there on this! Instead of just shooting emails at them week after week, how about showing them around a little bit? When they come to you and join your email list, nurture and build a relationship with them. But how? Think about it. When you invite someone over to your home for the first time, you don’t say, “Come over for dinner at 6pm” and just leave the door open with a little Post-It note on it telling them to come in and show themselves around! You greet them and probably give them a little tour and maybe put a drink in their hand. Nurturing your email list is the exact same thing. Another great example is dating. When you first date someone, in the beginning of your relationship what do you think would happen if you have a first date, than don’t hear from someone again for another week or two? Or three? They’re probably off your list. You were so excited and were the most interested in them after that first date. What did you want to happen? You want them to call you the next day. The same is true with your email list. Simply nurturing your email list gets results and is an answer for How to Increase Your Email Response Rate! Say you’ve got an opt-in on your website. You’ve got a specific call-to-action that says “Join my email list” or “Download this awesome freebie”. That’s fabulous! This is where we’re going to dig in. I want to share with you what your nurture sequence might look like so you can implement it today in your business model. When you property nurture the relationship with your new leads, you WILL get 10 times the email response rates! You want to send out about four to six emails over a one to two week time period! I know this feels uncomfortable. You don’t want to bother people, but I promise you that when you nurture the relationship, it will be worth it. Think about that first date! That person wants you to give them a call. They want to hear from you and so do your leads because they’re giving you their name and email address for a reason! This is when they are the most interested in you and they want to hear more! What should be in those emails? This is when they opt-in, You’re going to send them a nice welcome message and deliver whatever the freebie was that you offered. A nice general email with a download link will do the trick. Send them a story. Relate to them. Show them that you understand how they might be feeling. Also, remind them to grab that freebie download in case they haven’t had a chance to check it out yet. Show them that you can actually solve their problem. Whatever their struggle is, show them examples of things you have done. Deliver Proof. Build up that authority status, the trust factor, with this new lead. Provide a potential case study. Offer testimonials. Introduce the next step by inviting them in for a free consult. A complimentary call. Give them a last chance offer. This is a very tactical example of how over four to six emails within a one to two week period, you can begin to nurture and build the relationship. Remember… you’re just starting to “date”. They’re interested and they want to hear from you! This type of nurture sequence will help you gain 10 times the response that you are getting now. You will start getting people who WANT to take action! Once they sign up for that free consult, now you have a very warm lead that you’ll have an easier time converting into a client. It’s as simple as that! Take action today!